It’s used only for target shooting, and being short and ported, I wear double protection when shooting it. Usually it’s shot at my Club which is No Blue Sky, meaning it’s in a concrete bunker. Loud when shooting anything. 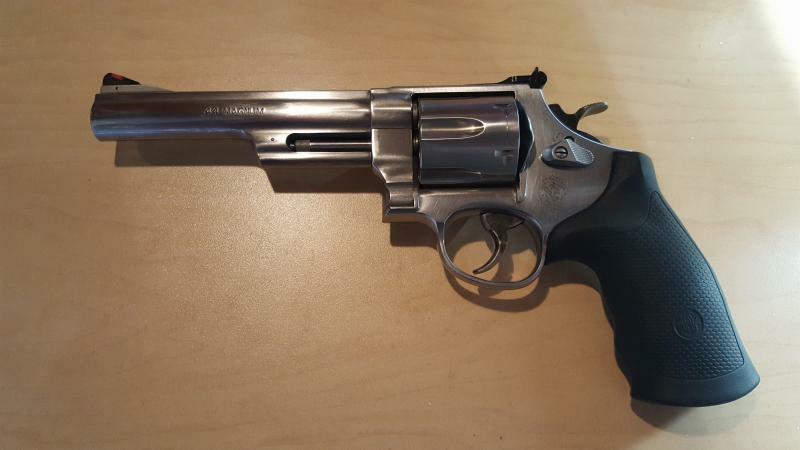 I don’t shoot it much, but I find it fun and a very beautiful revolver. It says "signature" but when I sign the screen it doesn't show up online.. 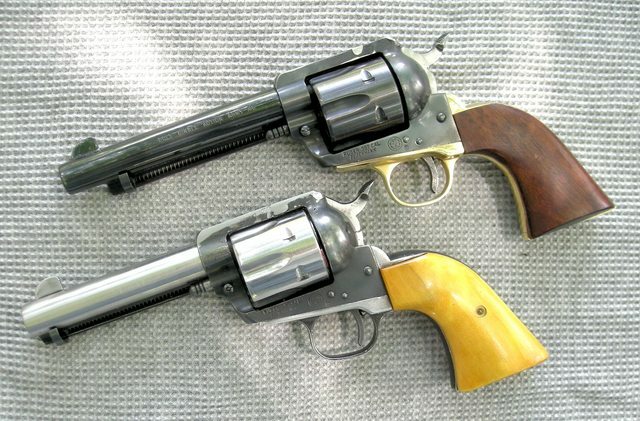 Here ya go Johnny, a couple of 45s that used to be 357s. Once they're usable I'm happy with em. Only 6 shooters though. Reminds me of Tuco, from the 'Good the Bad and the Ugly'. Walk into the store, pick a few revolvers, and make one. We're lucky today, manufacturing tolerances on revolvers are pretty tight and swapping parts out gains very little if anything. Even cylinder gap decrease is negligible with different cylinders and you run the risk of timing problems swapping out cylinders not made / fitted for the revolver. Now if we're talking 1911's they may be a different story. Accurizing some of those loosey goosey guns can make a BIG difference in accuracy and possibly performance too. I really want a Model 17 with the 8 3/8” barrel. Epic woods/camping/pack/squirrel gun. Ohhhhhhh, I have a MINT one! 'Stole it' really ... was for sale at a shop for $475 and I couldn't get the $$ out of my pocket fast enough! ... if I ever decide to move it, I will let you know! I kept meaning to add a revolver to the safe but couldn't settle on whether I wanted a .45 for all the reasons you'd want one or a .22 replica to plink away with and never think about the cost of shooting it. I'm not going to get both as I'm never going to carry either and I hate tying money up like that. Get a .357 Magnum. You can shoot .357's and .38 Specials in it. .38 Specials are pretty economical to shoot especially if you reload. 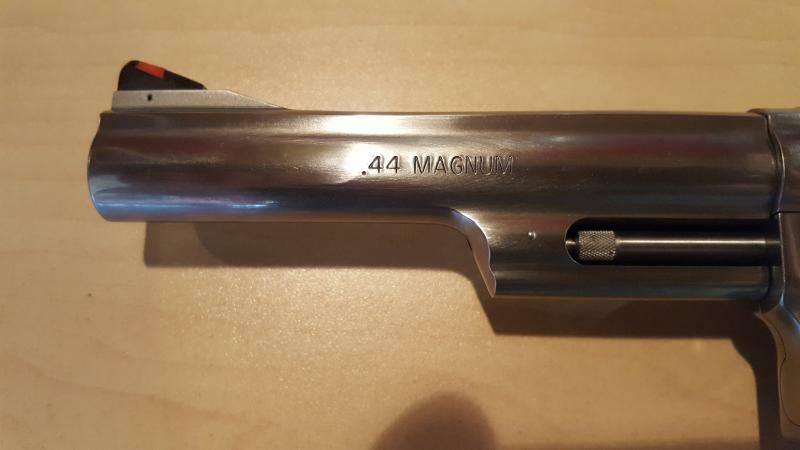 so i'm 5 weeks into a 9 week overtime stint and i thought i'd treat myself and ordered a s/w 629 6" .44 mag.should be here in a week,due to the canadian thanksgiving on monday. i gave up trying to find a reasonably priced model 29. also ordered 250 rnds. of 240 gr. tmj 44 mag,250 of swc,250 of 44 spl.and 500rnds. of swc 44 spl. i think i'll put a few rounds through it before i monkey around with grips .bang.bang. 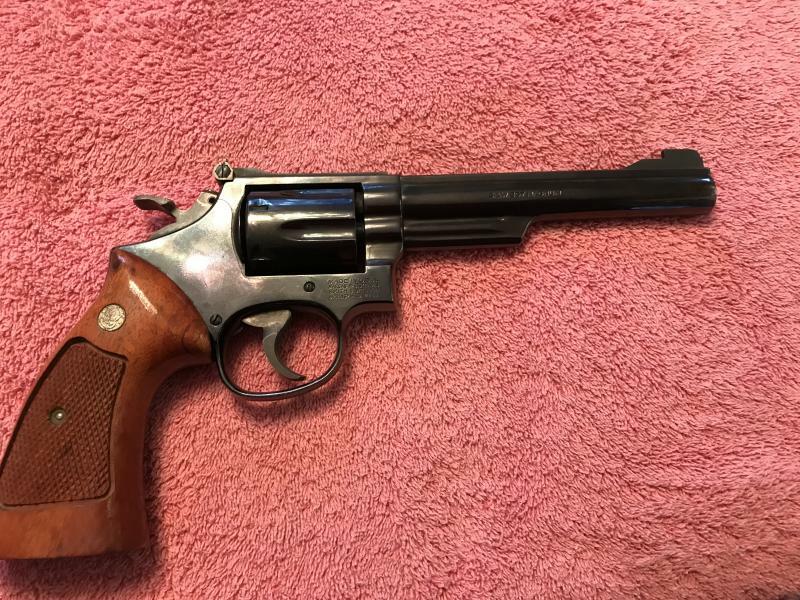 picked up a model 19-5.it's a .357 but being it's a K frame it will probably see more .38 special than .357.now i'm on the hunt for a model 586.i don't have an L frame yet and really like to shoot magnum loads.my .44 goes with me every time i hit the range.big smile every time i pull the trigger. 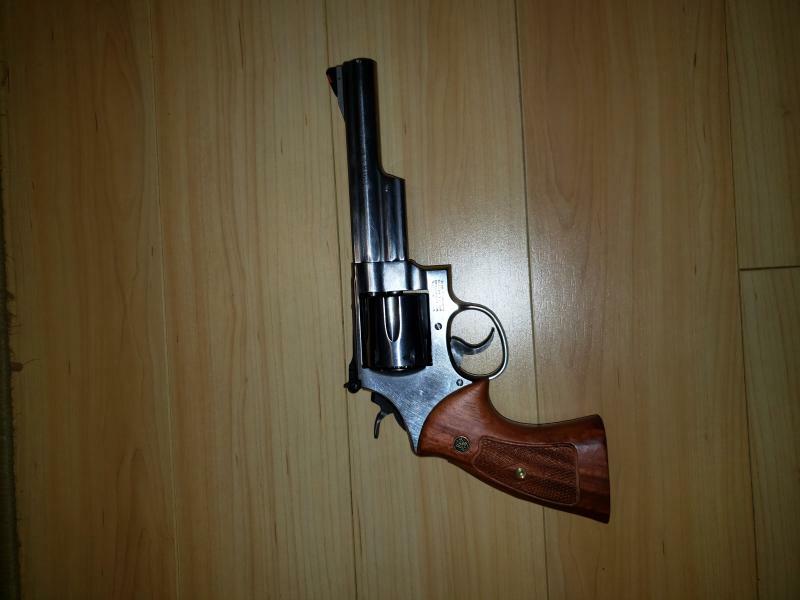 FWIW I just picked up a blued mint Ruger Single Six (new model) 22LR single-action revolver with real Sambar Stag grips for really short money, like for what just the grips alone are selling for on eBay ($200-$300). I just did a trigger job to that 22LR the other night. BEFORE any tuning, the trigger pull was 5-1/2 pounds. With just a good and thorough disassembly and cleaning, followed by smoothing any bearing contact surfaces (not sear or hammer) and then lubing it, the pull was brought it down to < 4-#s. I used a moly grease on the sear engagement surfaces and oil of one’s choice anywhere else. Pet Peeve - I cannot believe how many people run a gun ‘dry’! I had read a tip online (single-action shooters) about dropping off a leg from the trigger return spring (under the grips) but I didn’t like that idea (spring would now be unbalanced, floats/flops around on one side, and could interfere w/ the hammer spring). So with further YouTube research, I tried modifying the angle on the return spring legs where they hang onto the pin hanger. It is a simple adjustment and only only needs removal of grips to do so. I only bent them up ~1/8” at most. And now after doing so, that dropped the pull down to 3-pounds, or a full pound off. Having machining and prior gunsmithing experience (schooled too, especially on S&W revolvers) I rechecked the sear engagement angles and surfaces using a 10X loupe, touched them up ‘lightly’ with fine & ultra fine diamond stones, then applied Brownell’s ‘Action Magic II’ elixer and moly powder to the sear tip and hammer notch, burnished in well. AFTER ... the final trigger pull is just a few ounces over 2-pounds! And 100% safe and reliable. Sweet! How do you check the angles through the loop? I can't imagine protractors are all that accurate at such fine levels of detail? Is there a different tool/ perhaps a background mat that you use for this? It also is not one of those tiny ones you see jewelers using, as the lens on this one (Bushnell & Co) is about 1-1/4" across. got new stocks for my .44 today.vast improvement over the factory black rubber ones that were way too thin and left a giant bruise on my hand after 12 shells.nothing feels like an n frame with target stocks,it felt big before,now it's a monster. went to the range today to test drive the new stocks on my .44.awesome! went through 40 rounds with no hand fatigue.put 100 rounds of wadcutters and 50 .357 through my s&w 19-2 and after 70 rounds of 9mm through my beretta 92 it was 3 failure to ejects and 2 stovepipes.i gave up and put it in the case.no more american eagle ammo for me.good thing my life didn't depend on it.